This page contains sections of common sections of code, which you can learn from, copy straight into your VBA projects, or just to remind you of the syntax. Subscribe to the newsletter to receive exclusive content, tips and tricks, tools and downloads. 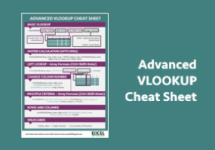 You will receive the Advanced VLOOKUP Cheat Sheet for FREE.